This is the basic recipe for about four bottles of cordial. The same process can be used for orange or grapefruit cordial, varying the sugar perhaps, on the basis of the sweetness of the fruit being used. Boil the water and dissolve the sugar. Allow to cool slightly. Mix the citric and tartaric acid together and dissolve into a paste in a bit of the syrup. Add to the syrup and stir to dissolve. Allow to cool. In the meantime, rinse the bottles in hot water (I prefer bottles with screw top lids, so I recycle store-bought cordial bottles. Also, recycled Grolsch bottles work well, and are a great size for gifts, label removed of course). Once the syrup has cooled, add the lemon juice and zest and stir. Pour into bottles (using a funnel and pouring jug is easiest) and seal. If you don’t like pith or a few seeds in your cordial (I don’t), use a strainer to skim the top before pouring into bottles. 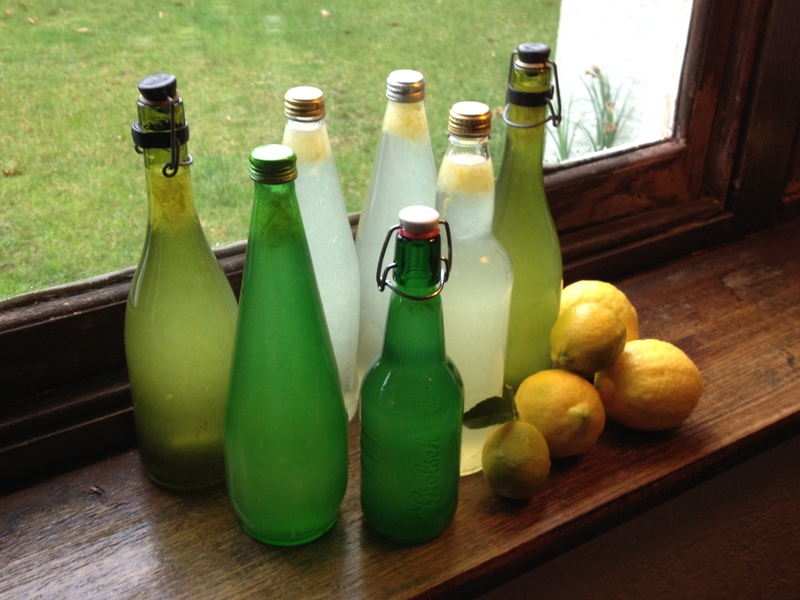 Lemon cordial can store for a long time; the more sugar you use, the longer it will last. That said, once an addiction ensues, it won’t last long at all. Keep the current bottle in the fridge as it’s best really cold. Add honey and ginger to a lemon cordial with warm water, and you have a cold remedy. Hi – I like the sound of this recipe. My lemons are small. For your 6-8 lemons what quantity of juice would that approx yield. I hand squeezed 20 lemons last week and got 250mls of juice. Hi Jennifer, You need about a litre of juice I find, to get the right balance of sweet and sour. HI Romina, Capping them and then keeping them in a coolish place should be fine but I’d do what you think is right, as I don’t know Vanuatu! Finally the stars and planets align and I am in the supermarket and remember a/ we need lemon cordial and b/ I can use this recipe but need to buy the acids. Neither, until today, has managed to occur at the same time. Delicious!! And most importantly, the tick of approval from the 9yr old. Please do expand … I clearly don’t remember that episode …!